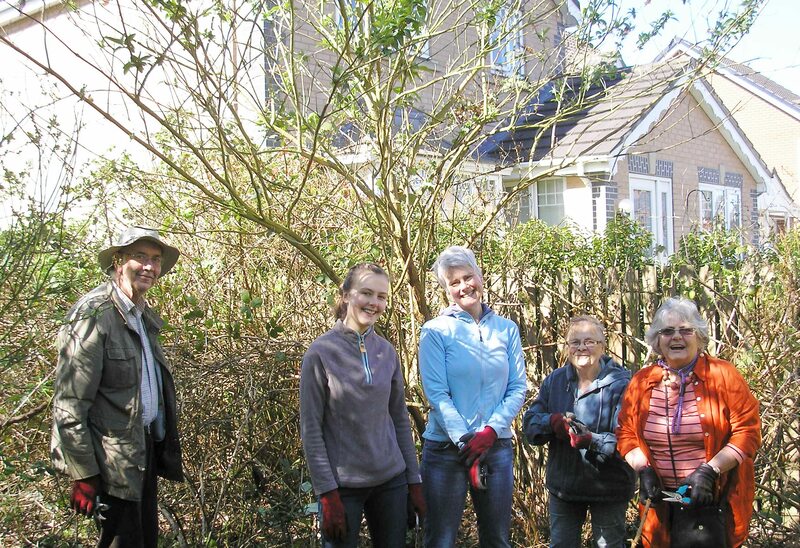 Harriet, Claire, Margaret, Pam, Louise and Malcolm bravely attacked the brambles in the spring sunshine at the end of April to rescue an attractive buddleia from being choked behind the west bund. It’s not strictly native, but excellent for attracting butterflies, especially with nearby nettles for their caterpillars, so we are leaving three of them. 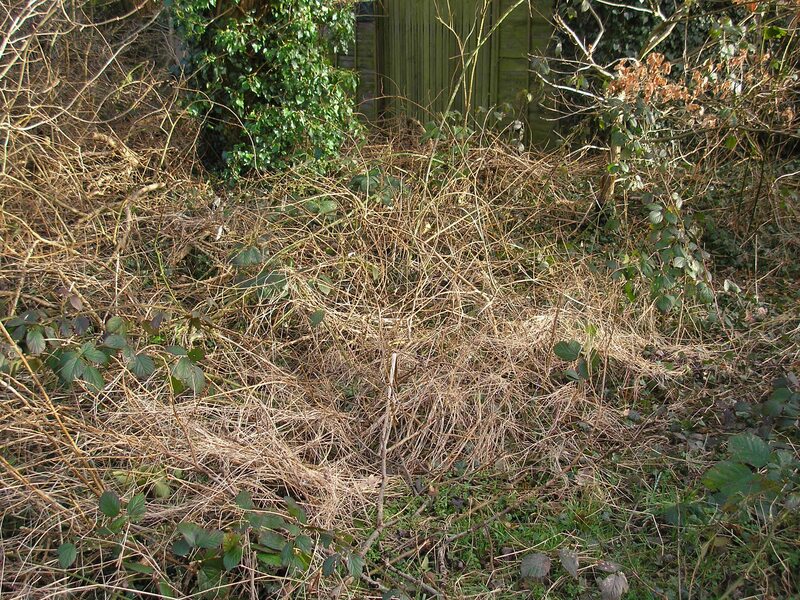 We’re not removing all the brambles, by the way; just reducing the size of the really over-grown patches with too much unsightly dead material and/or branches invading gardens adjacent to the site. 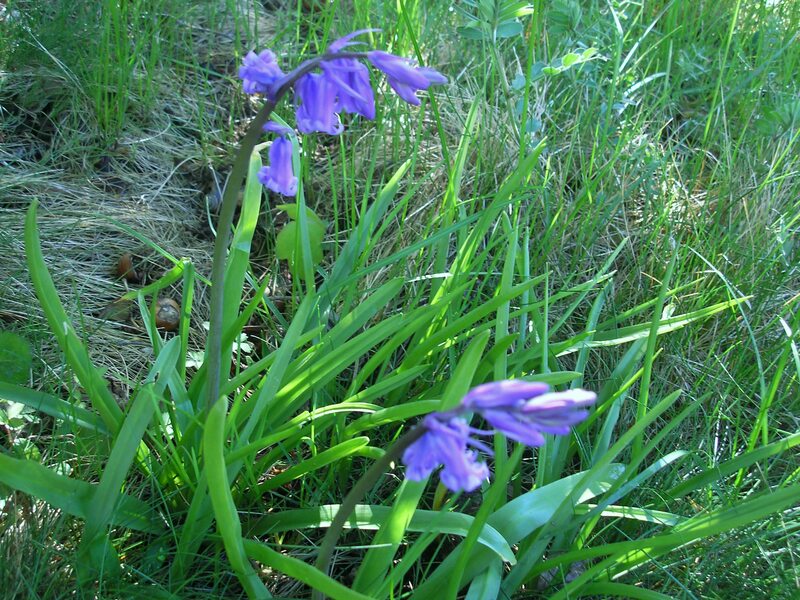 Though not working at the Nelsons Lane end near the gate on this occasion, we couldn’t resist adding a photo of the beautiful English bluebells that are re-emerging in that area. They were planted by MCT in autumn 2013. 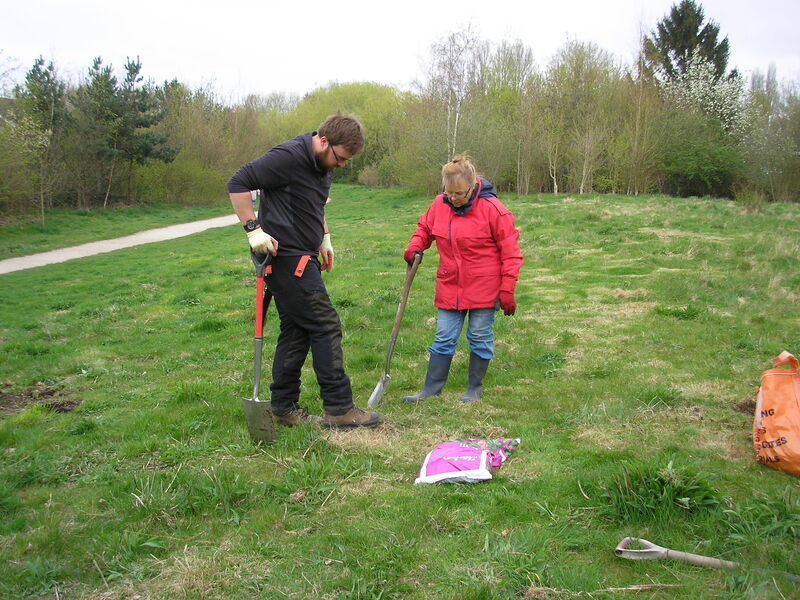 MCT does it’s best to make sure any species added to the site to improve biodiversity and habitat are native and of local provenance. 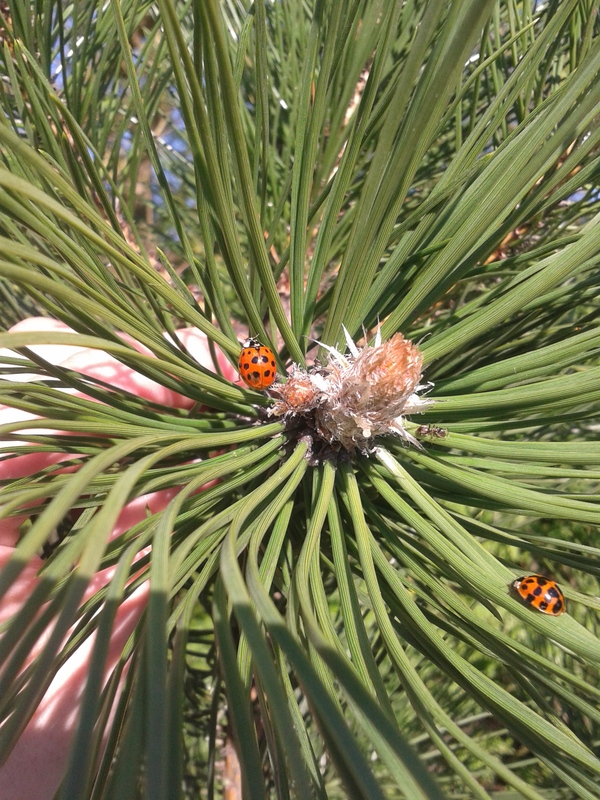 However it can’t keep out all alien species such as the predatory Harlequin ladybirds as seen in Dave Moore’s photo below. Meadow progress As mentioned earlier, over recent days we replaced many oversized clumps of grass with fresh soil to support wild flower seed planting. 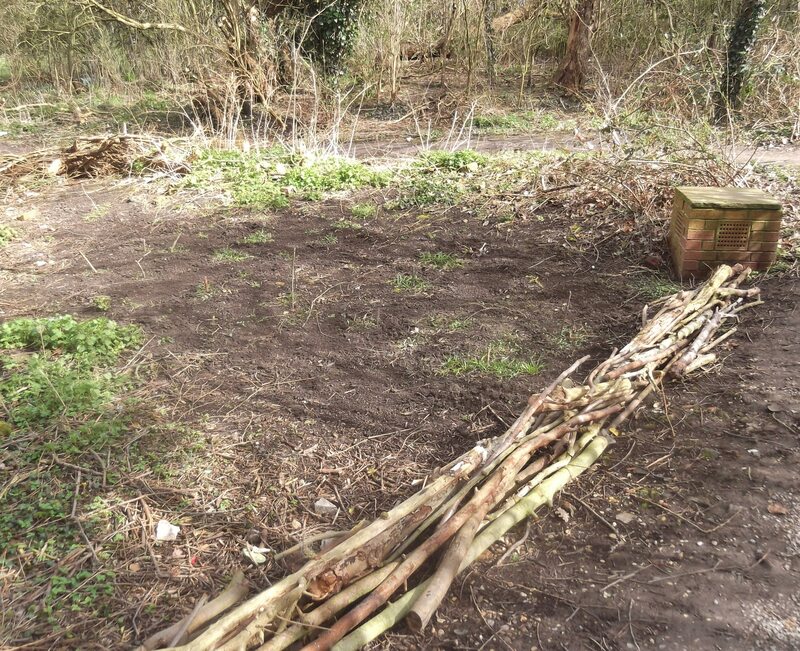 We used wild flower seeds from the Kew Gardens Grow Wild campaign, but in a slightly different way from what they planned to be minimally obtrusive and leave the meadow suitable for exercising dogs. 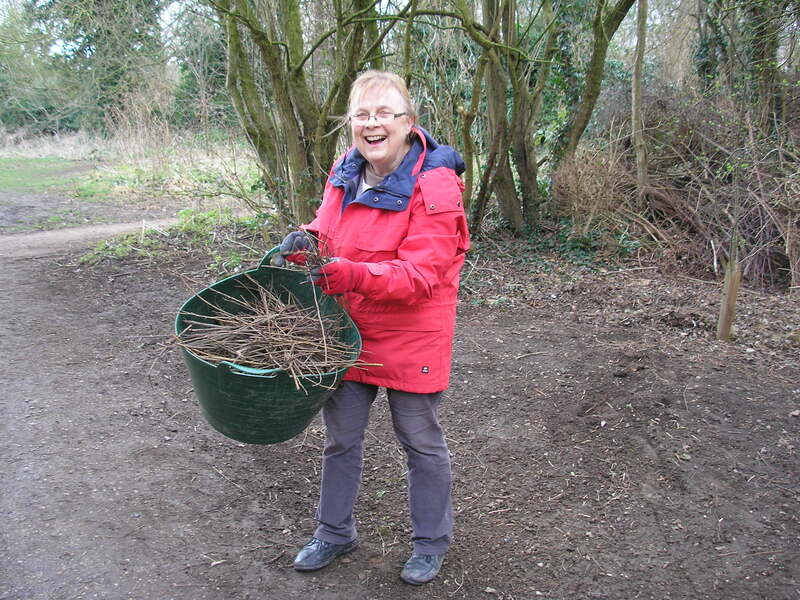 Seven volunteers worked on this at our regular Sunday session, as Pam’s photos show. 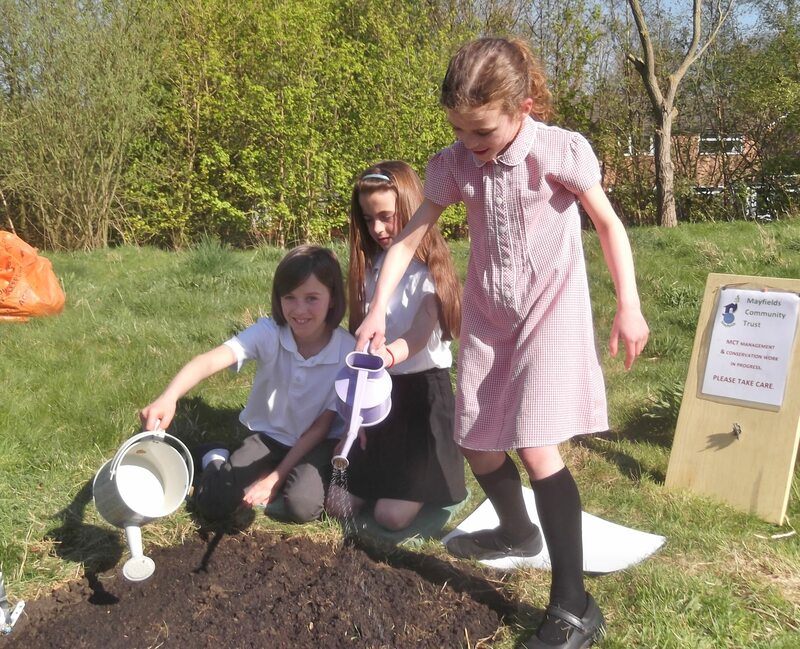 We had more fun the following Thursday when 3 of our junior volunteers, Olivia and Lucy Brown and Florence Pearson, came out with their mums to help. Louise and Malcolm watered the re-seeded patches each evening (where’s the rain when you want it?). You really start to feel spring is here when the first bluebell flowers on the site and the cherries look so magnificent just north of Nelsons lane. 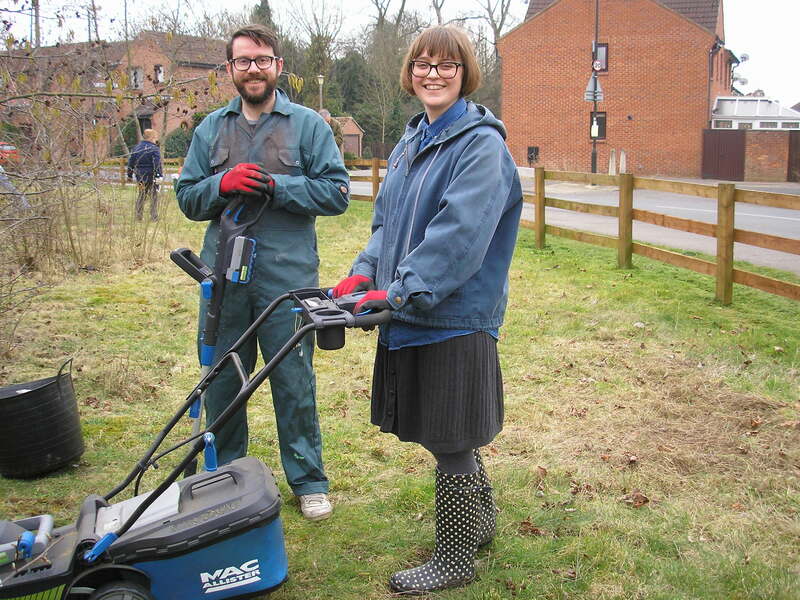 Downside is the need for more mowing of the grass to keep pace with CYC workers (thanks to Pam for the photos)! What’s happening on the meadow just now? 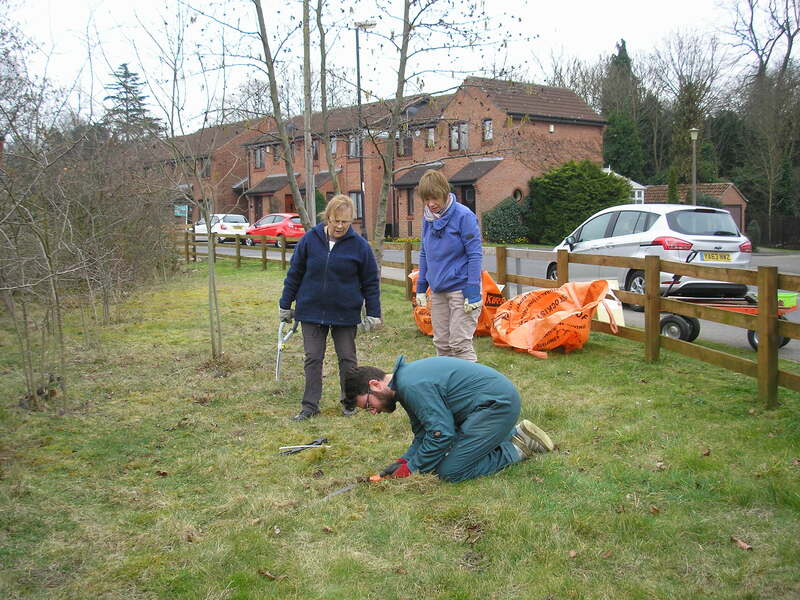 Restoring the wild flower meadow is a challenge. 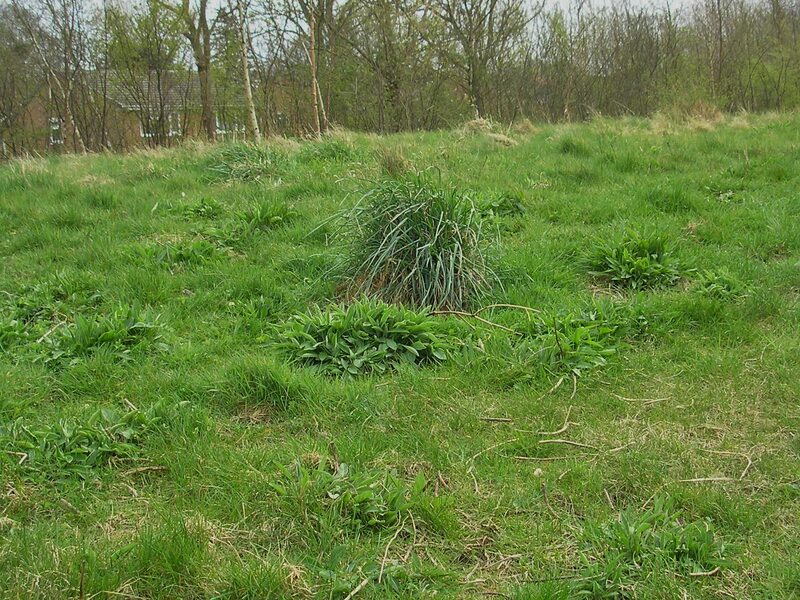 Since first planted >15 years ago, a vigorous perennial clump-forming grass started to dominate, out-competing the wild flowers. This was helped by atmospheric pollution with ammonium and nitrate in York, which adds about 25 kg of nitrogen “fertilizer” per 100-metre square every year. The grass was the main beneficiary! 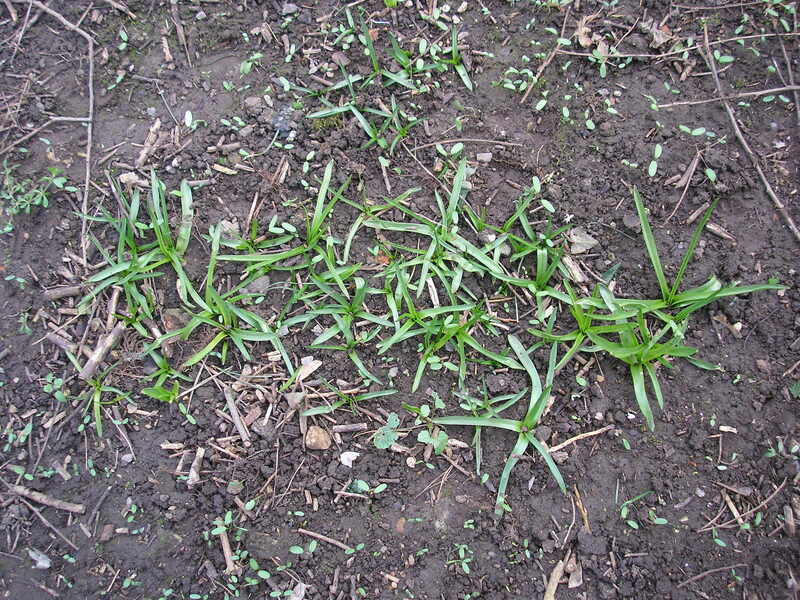 MCT has been removing grass selectively by mowing around remaining wild flowers several times when possible or with sheers to reduce the soil nitrogen status – much N goes off site with the harvested grass. 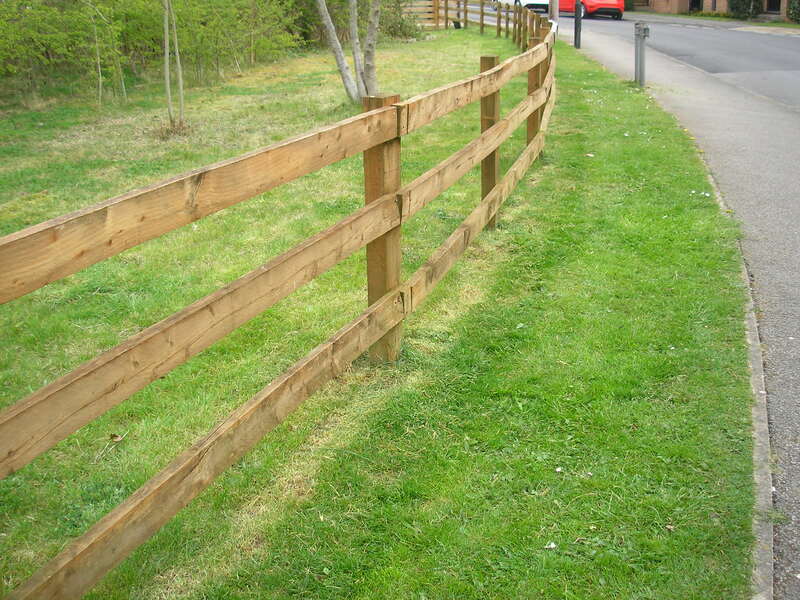 This provides a better environment for the wild flowers wanted. 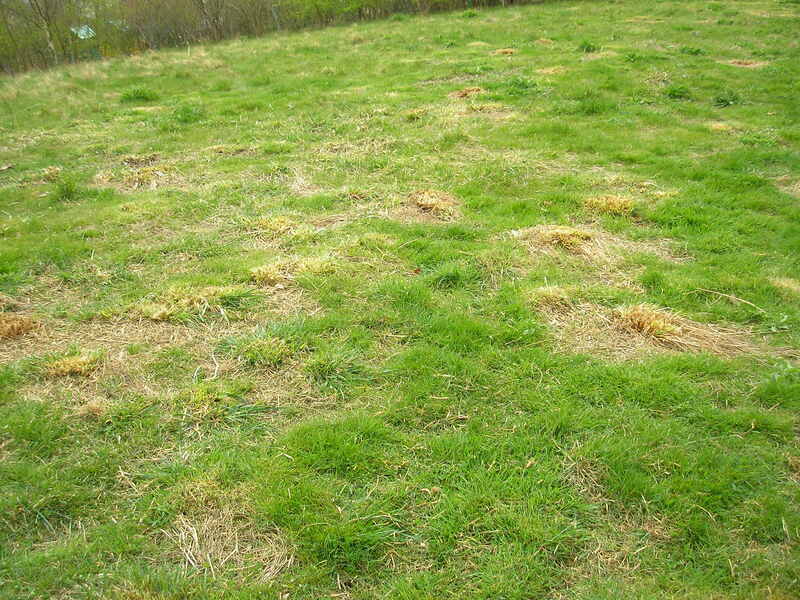 You can see below where we have been cutting clumps of grass this week. 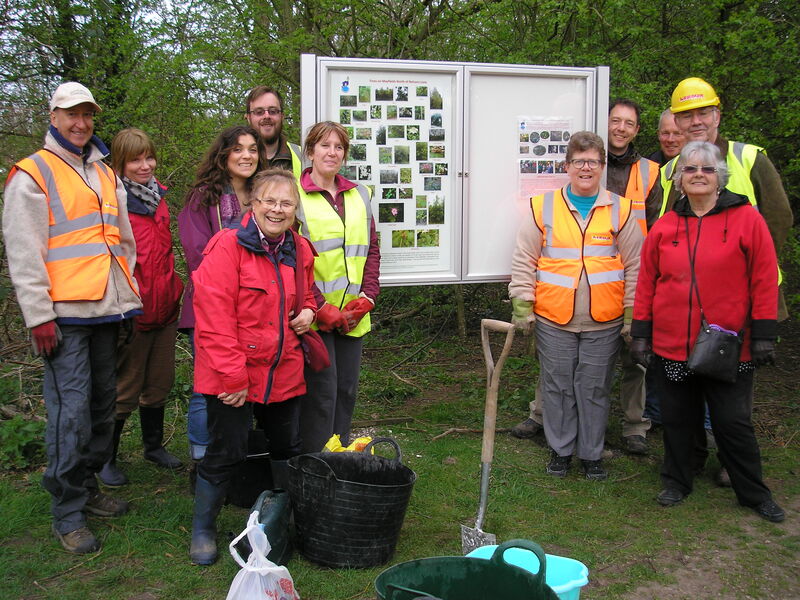 We had 13 helpers at our volunteer session on Sunday 12th April to help us erect the second information board. 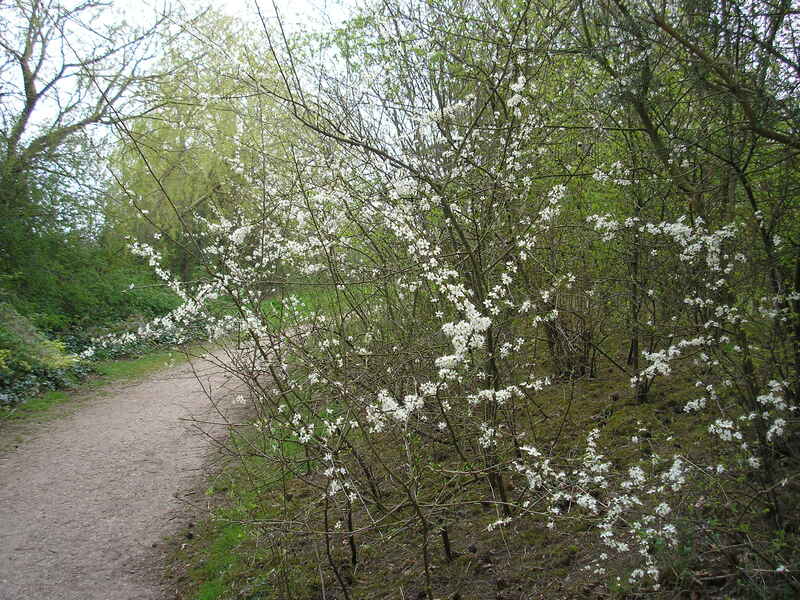 It’s been installed near the Little Hob Moor end, near the pretty flowering blackthorn just west of the path. Pam caught 11 of them in her photo below. 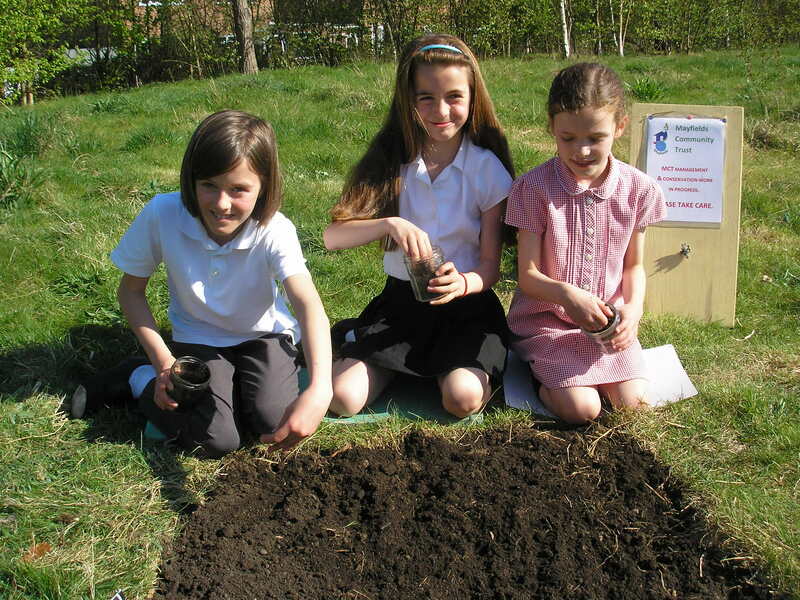 Many thanks again to the CYC Dringhouses & Woodthorpe Ward Committee for providing most of the funding needed. 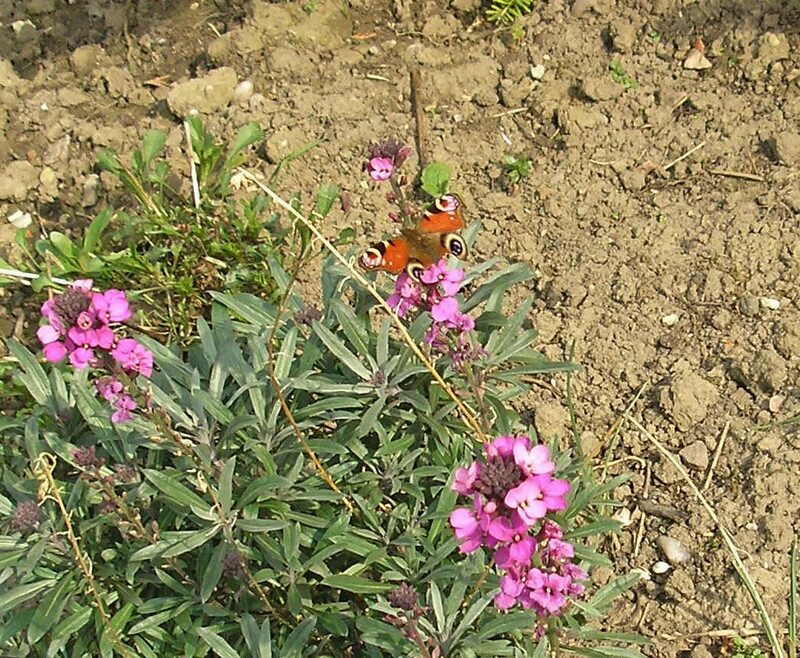 Butterflies seem to be around the Mayfields site already in the first week of April after the mild winter and spring. 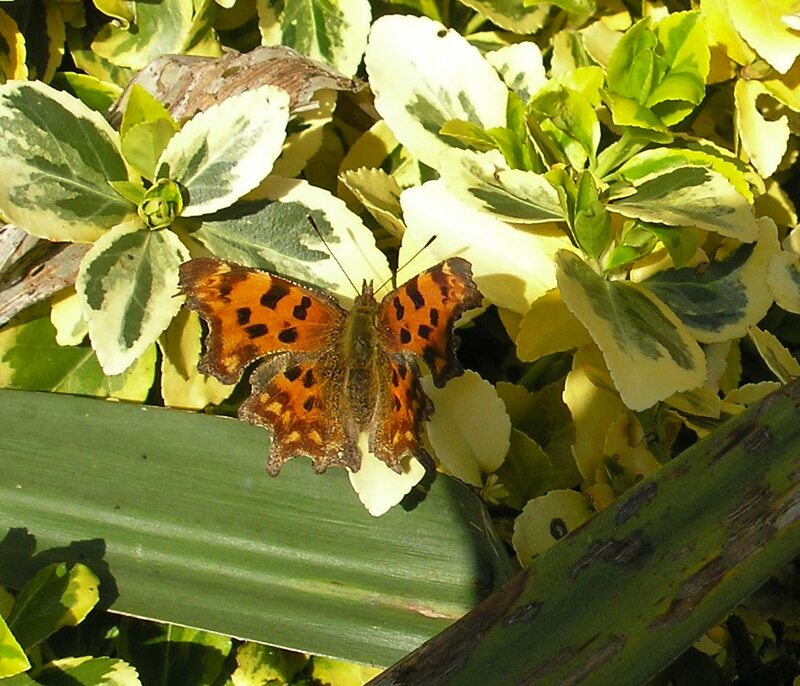 Pam caught these images of a Comma and Peacock in an adjacent garden. 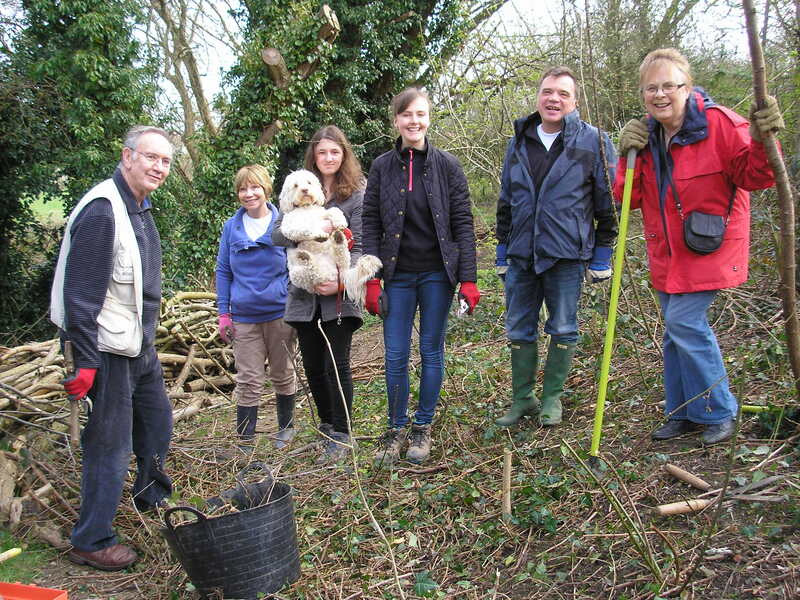 We had a splendid turn out of volunteers on Easter Sunday morning to enjoy the warmer weather. 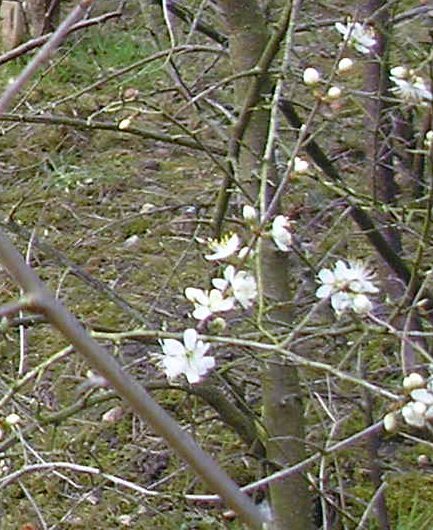 The blackthorns too were flowering in response to the mild weather. 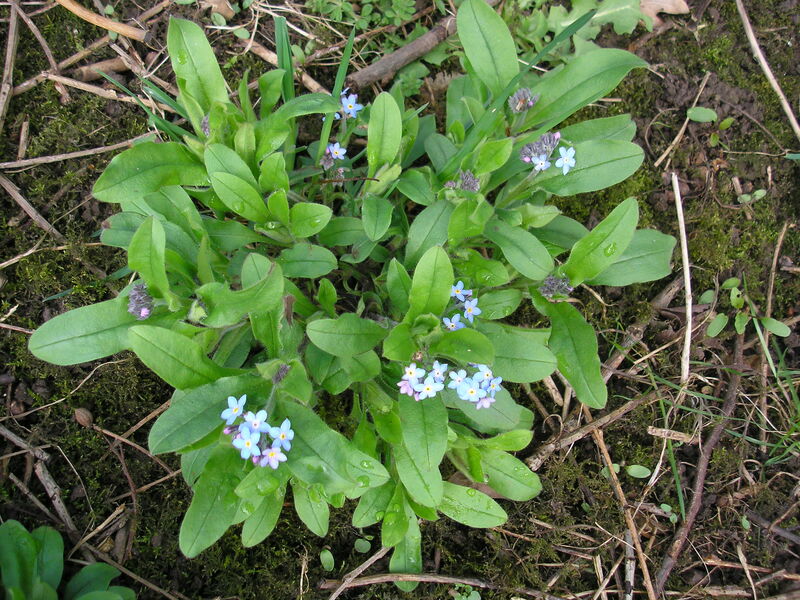 The forget-me-nots on the site make and excellent wild flower for April. 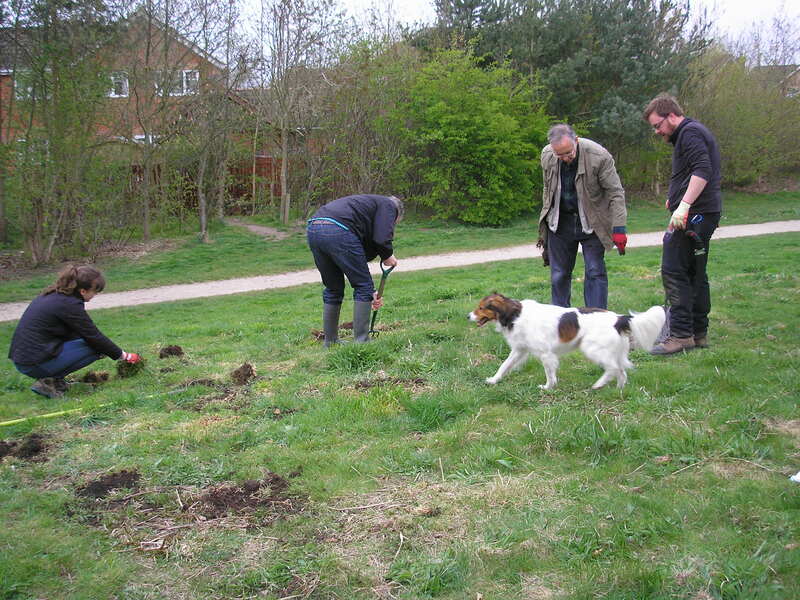 A clump appeared just behind where we have started to make the holes for the second information board kindly funded by the Dringhouses & Woodthorpe Ward Committee. 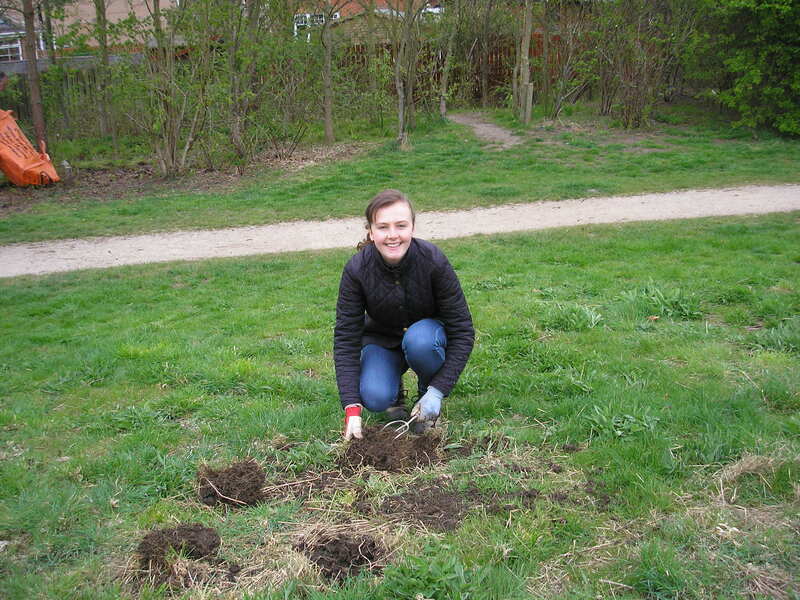 Kew gardens have a scheme on at the moment to encourage groups to establish areas of native wildflowers. It’s well worth looking at their web site for the beautiful photos (https://www.growwilduk.com/england-and-wales-wild-flower-seed-mix). 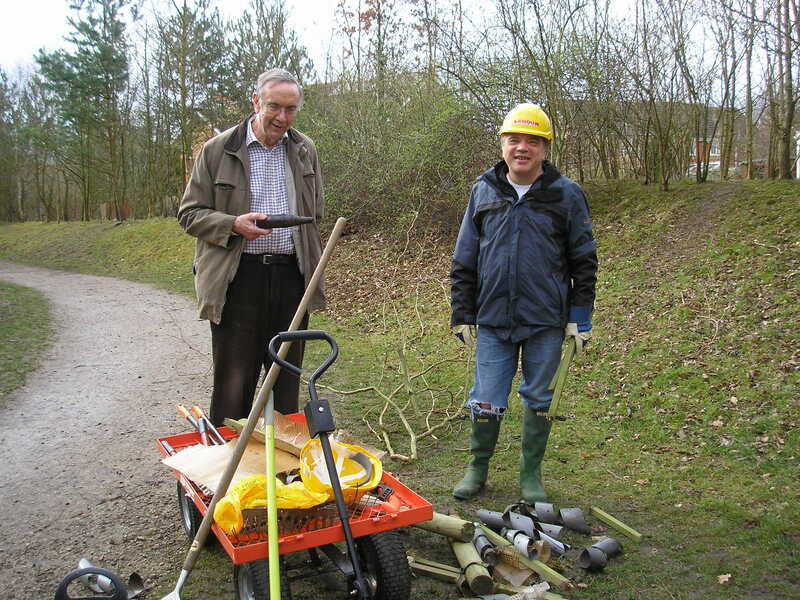 Seven turned out to help at MCT’s contribution to York’s Big Spring Clean (despite the light intermittent drizzle). 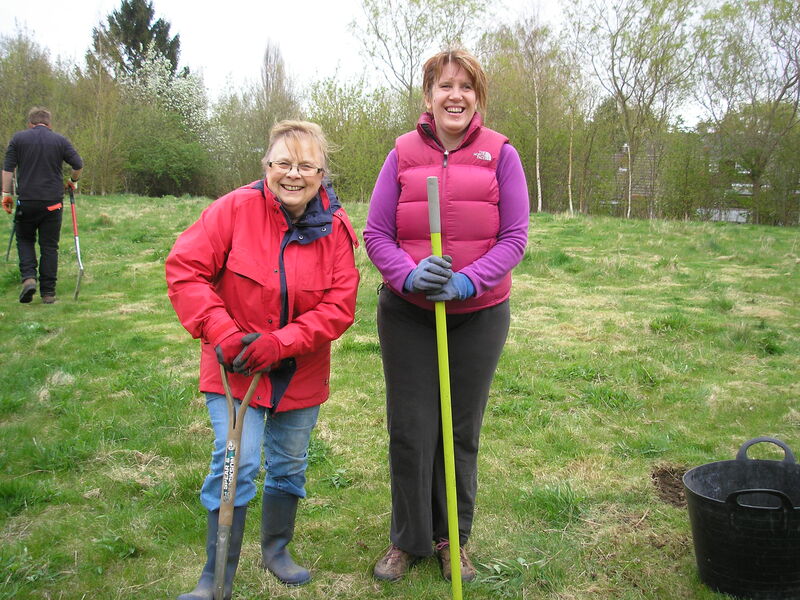 It was particularly a pleasure to welcome Claire and Harriet to their first volunteer session. 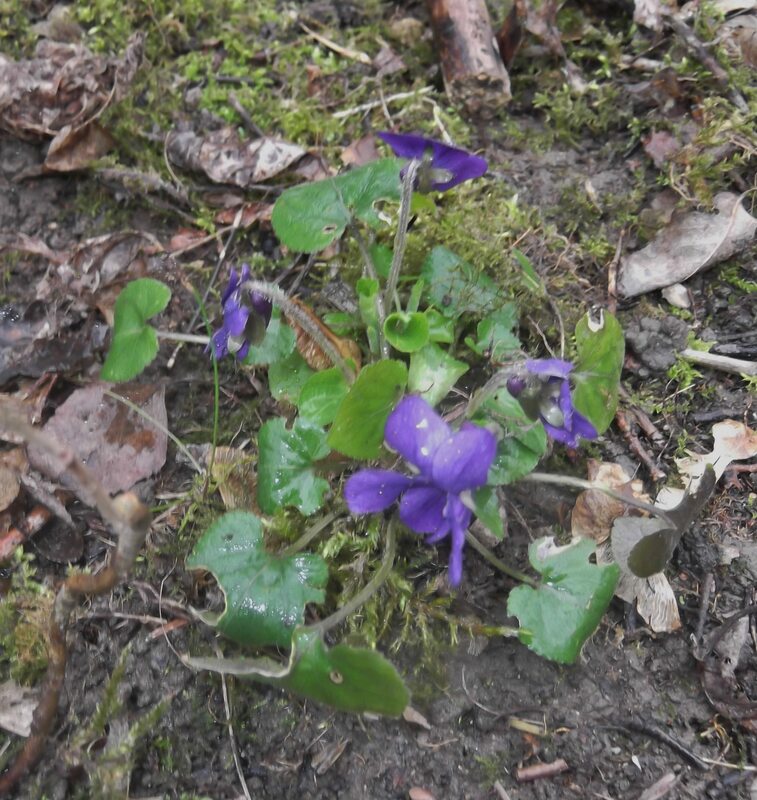 Our reward for penetrating the wood to access a particularly stubborn crisp packet was to stumble upon a beautiful wild violet in full flower. 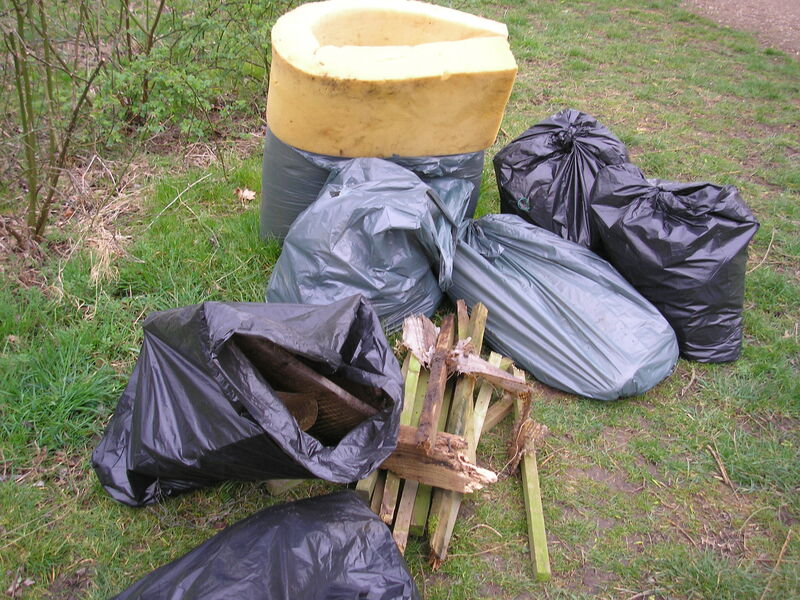 Several bags of litter were collected and taken off site, wood for recycling. 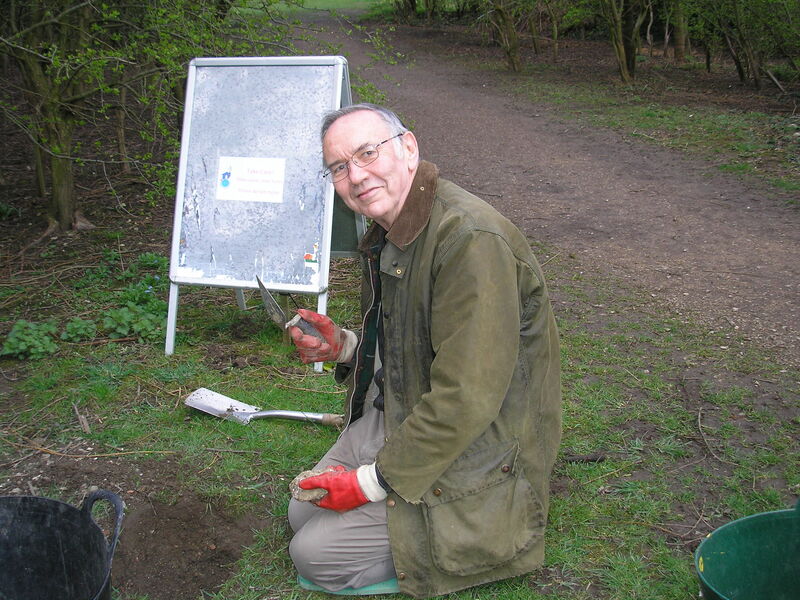 Though not part of the official aims of the Big Spring Clean, dog excrement was also carefully collected and deposited in the appropriate bins. We’re very grateful to the MCT Chair for volunteering for this unpleasant activity. 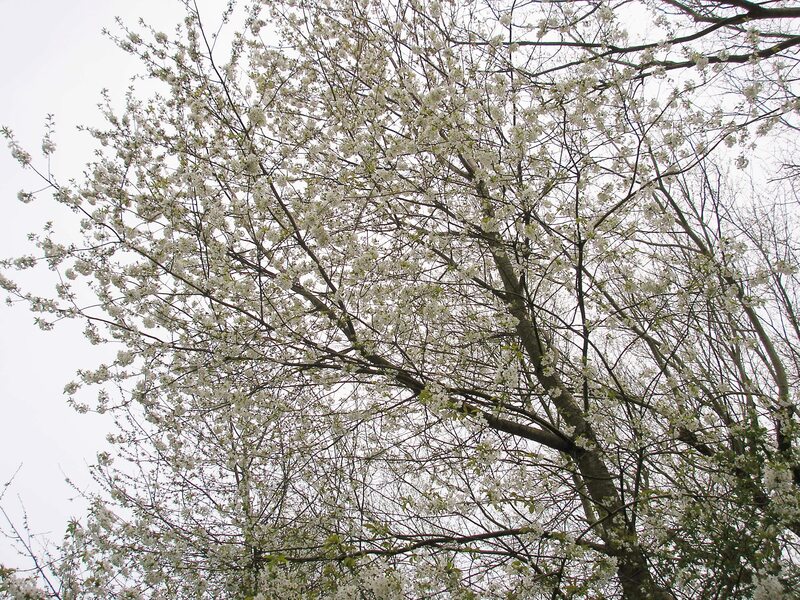 It’s lovely to see more signs of spring every week now. Pam Brown provided us with a couple of attractive examples. 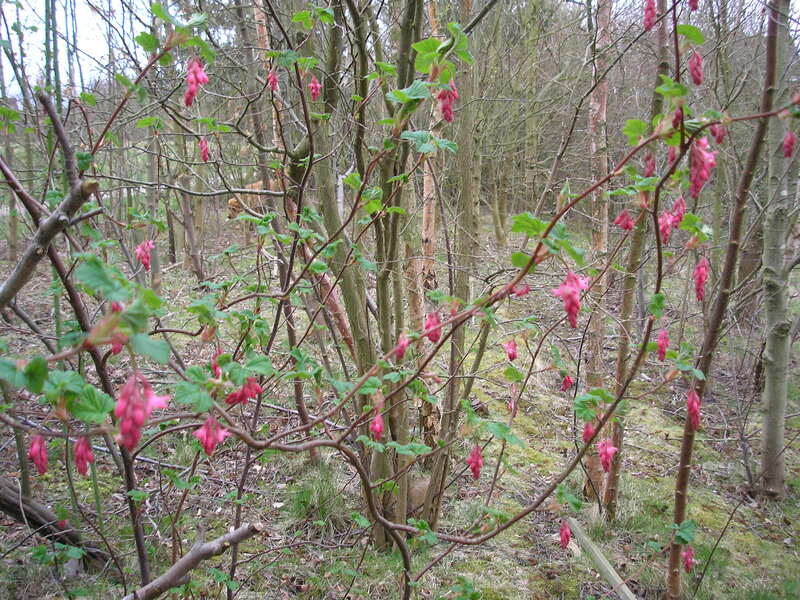 The flowering currant is almost certainly a self-sown seedling. 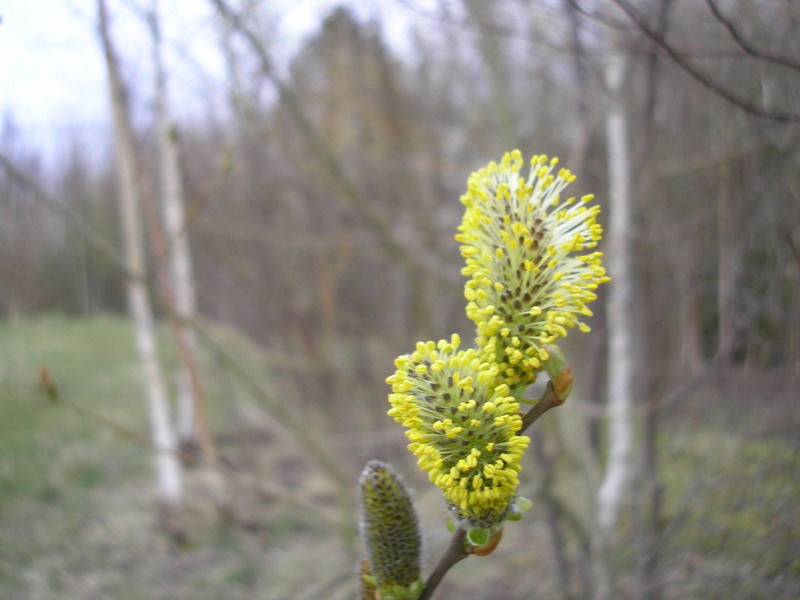 The other is the flower of a male Goat Willow. 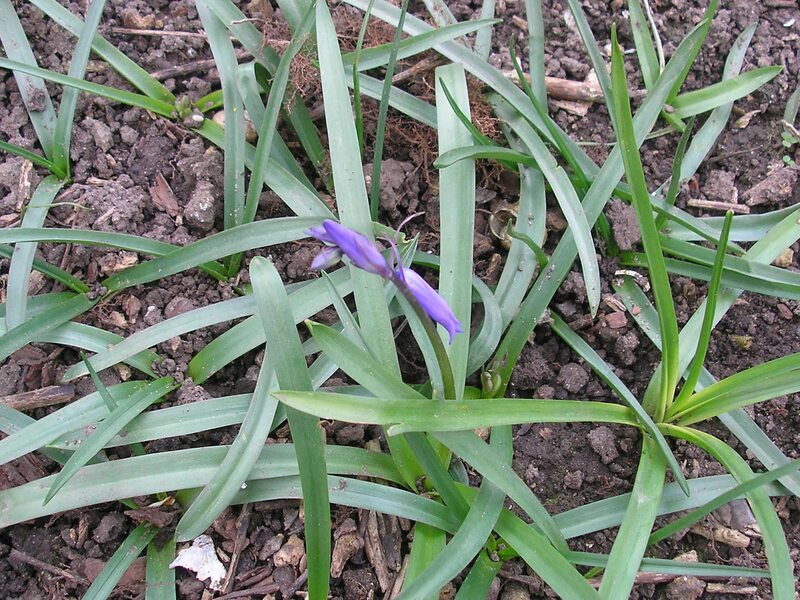 After planting 900 English Bluebells you tend to notice when they start to come through in spring. Sadly cyclists and some walkers and dog walkers, blissfully unaware of their presence, had created an unofficial short cut from the N end of the west bund to Little Hob Moor, heading on towards the railway underpass. It only saves them about 5 yards compared with the official path but had resulted in heavy trampling on the bluebells. 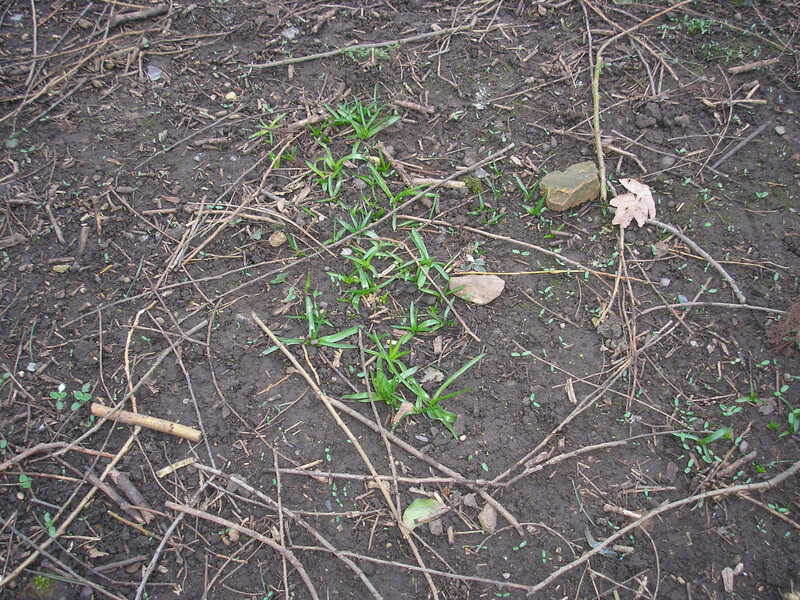 Bluebells on March 18th (left) and March 27th (clumps not yet trampled). MCT has temporarily extended the log-pile barrier at the end of the bund to discourage use of this unofficial short cut. 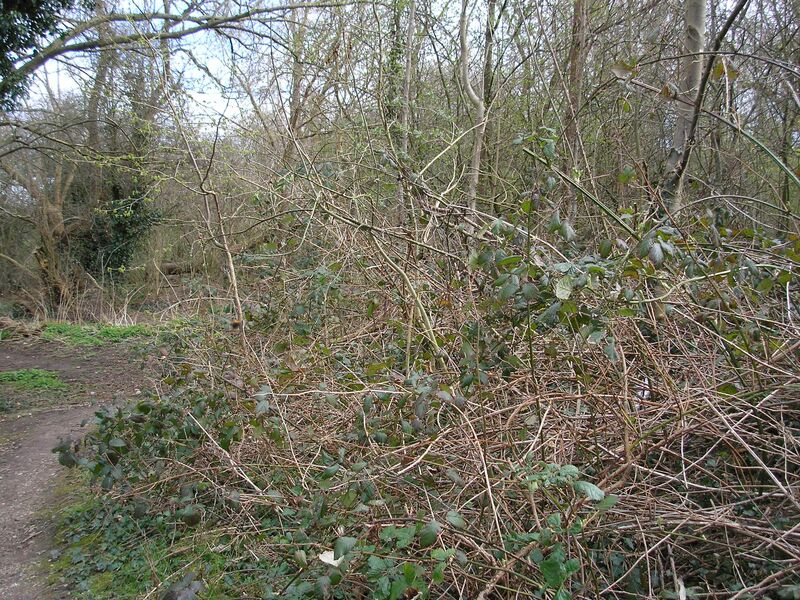 Lesley Abbott had done a great job over March in starting to trim back the brambles that had been choking potentially attractive trees at the north end of the west bund. 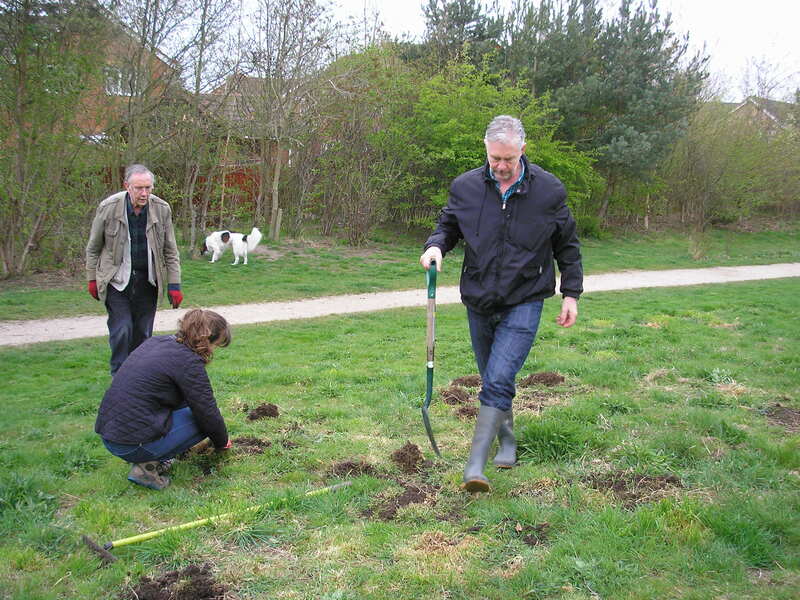 This encouraged Dave Moore and Malcolm and Louise to trim even more, to rescue a number of trees, especially small healthy hawthorns, in the area. 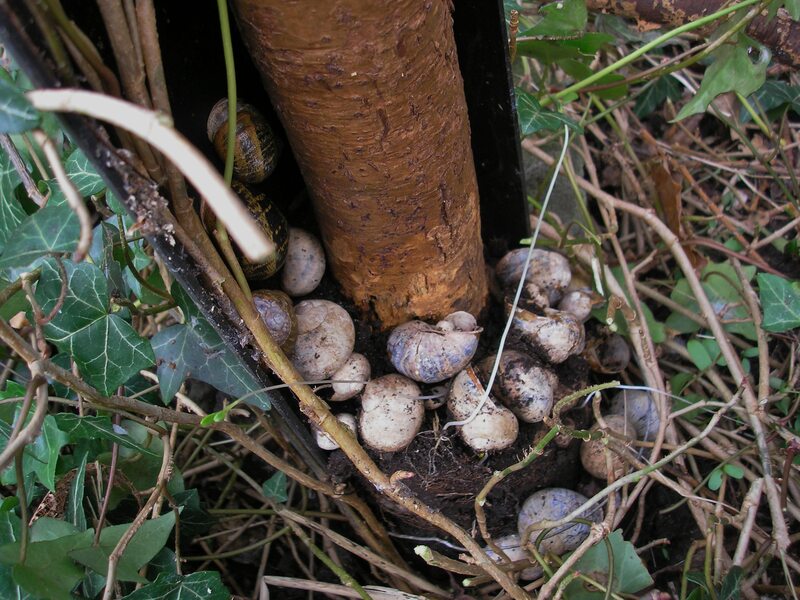 These have now been protected with tree guards as shown below in before and after photos. 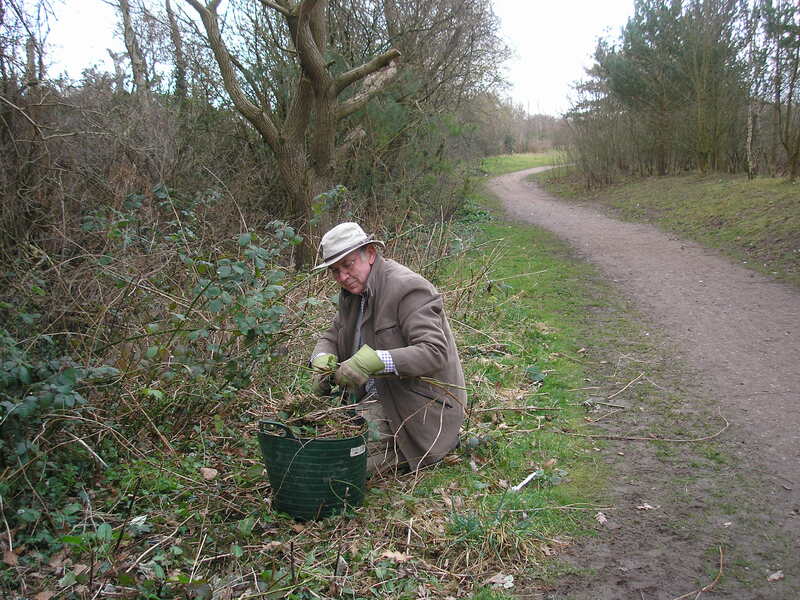 We plan to add woodland margin plants such as native primroses on the bank and control the brambles more in future. 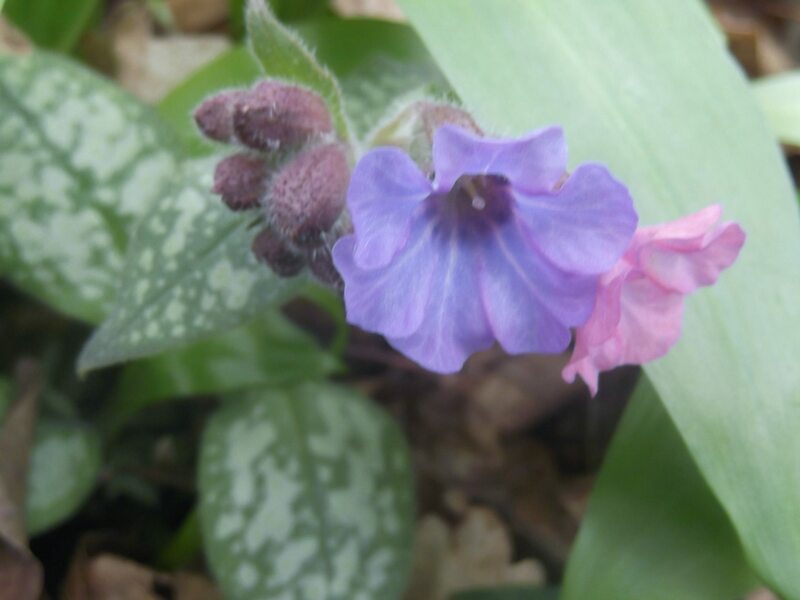 There’s still not a lot in flower in the third week of March at Mayfields, but we felt that these beautiful pulmonaria towards the rear of the east bund deserved space on the web site. 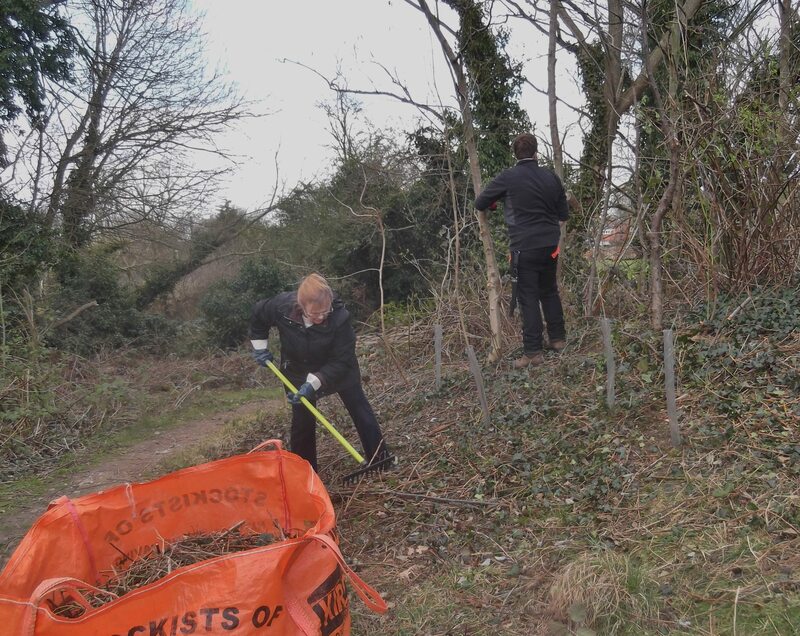 Six MCT volunteers tackled the overgrown patch of brambles, nettles and docks that was encroaching onto the east side of the path at the Little Hob Moor end on March 15th. 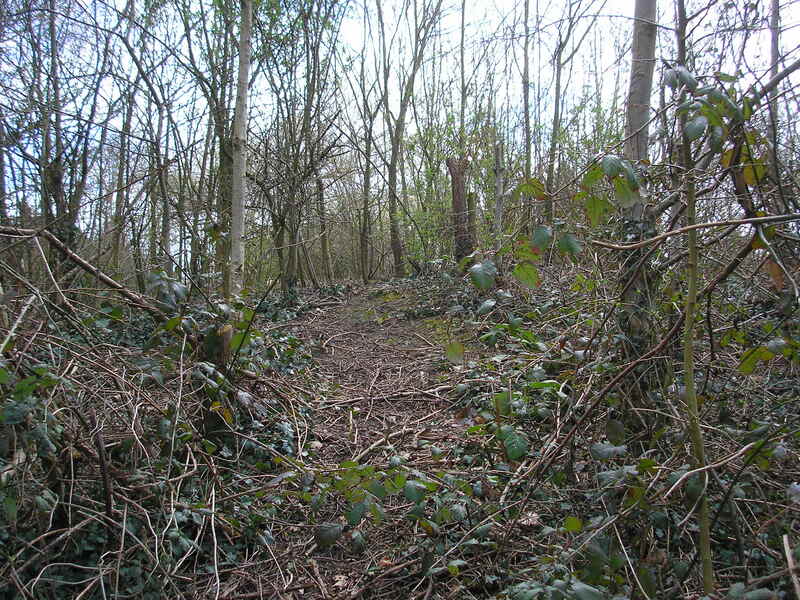 This was to improve the general appearance of the landscape and provide better growing conditions for desired tree species such as oaks and shrubs. 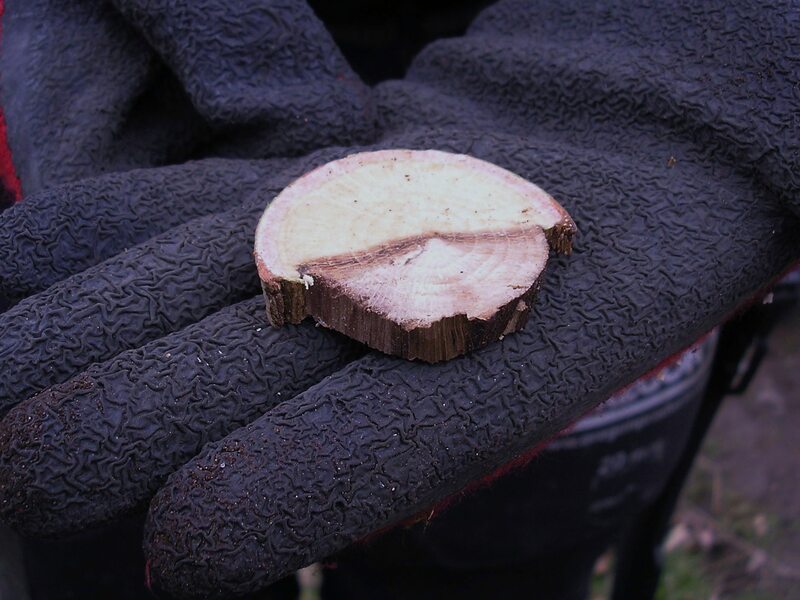 However for one oak (see below) it was too late as previous failure to remove an inappropriate tree guard had resulted in a build up of humus, snails and insects that had caused disease to spread half way through the young tree trunk. The trimmed material was cut up for composting as usual. 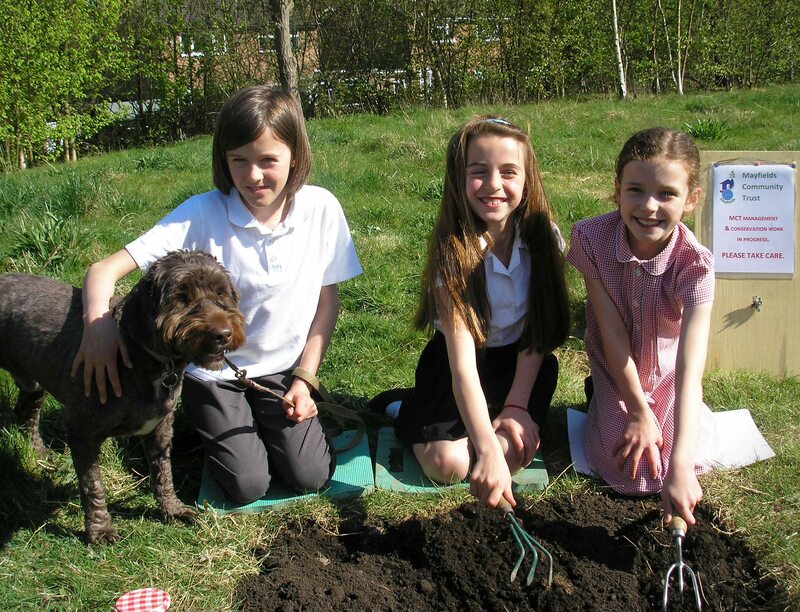 Dog excrement remains a problem on the site because of a small handful of thoughtless dog owners. 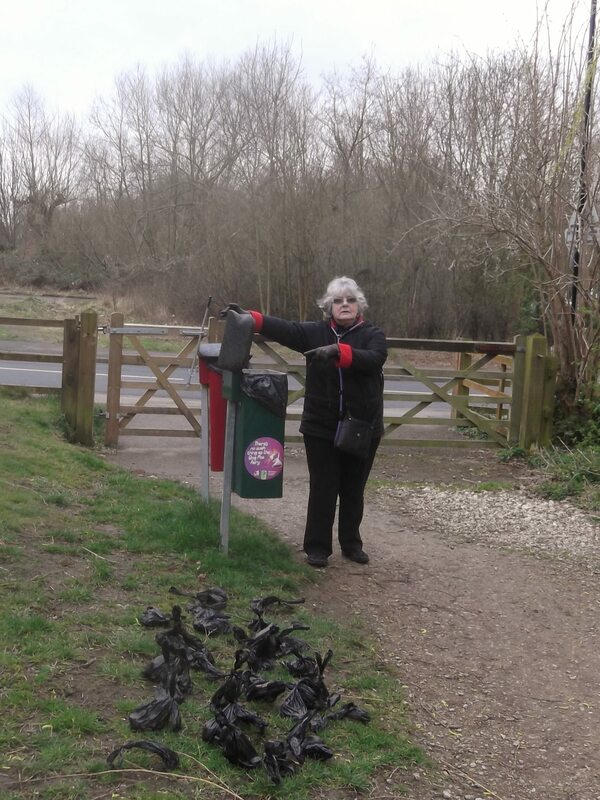 On Saturday March 14th the field work co-ordinator gathered up 29 bags of excrement in 45 minutes. A consolation was the beautiful bird song on the site all morning (and the thought that it will be a bit less unpleasant when we start mowing path verges!). 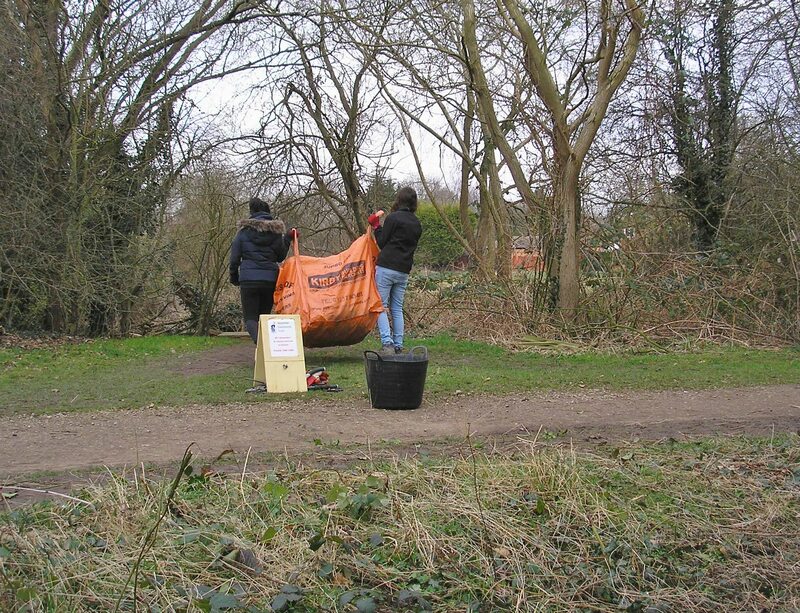 Eight turned out again on March 8th to blitz the path at the Little Hob Moor end, clearing the twiggy litter following recent windy weather (and some human litter!). 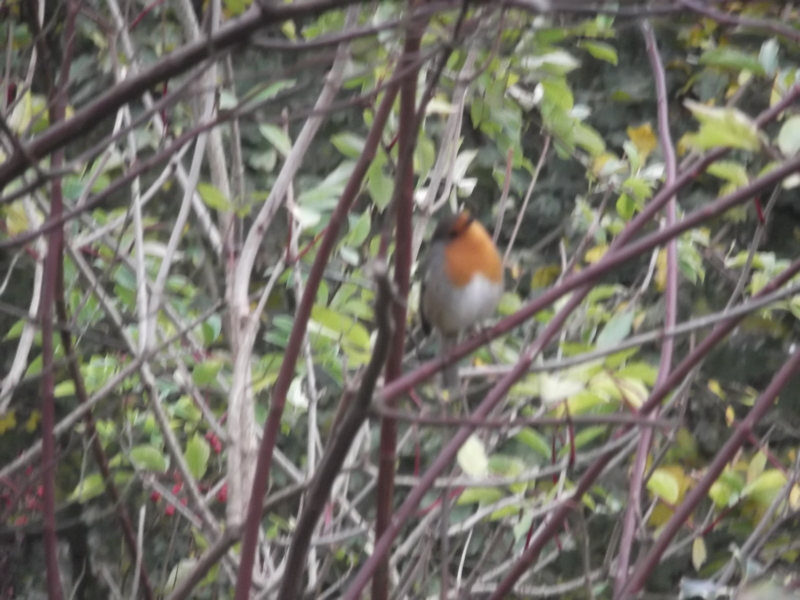 They were joined by one of the site’s several robins on the look out for potential food. It provided some pleasant musical accompaniment. 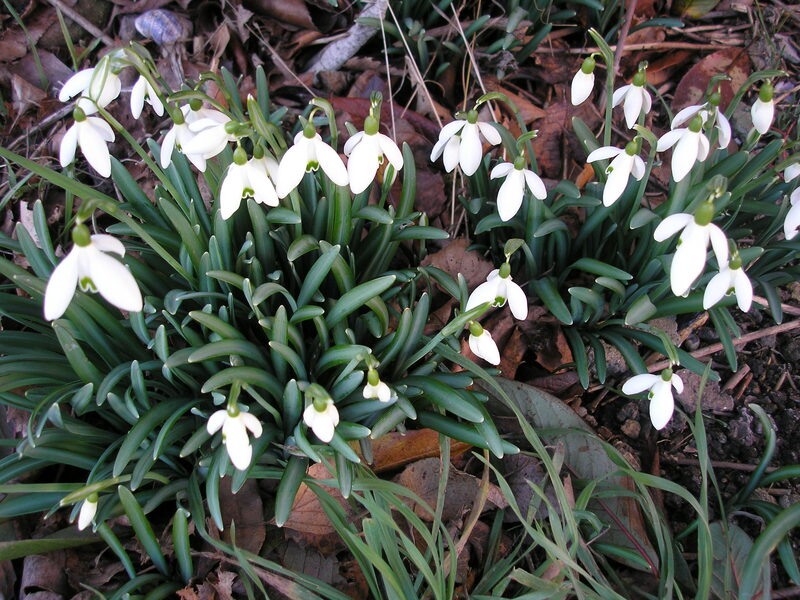 While there, Pam photographed a patch of snowdrops to provide a flower-of-the -month for March. 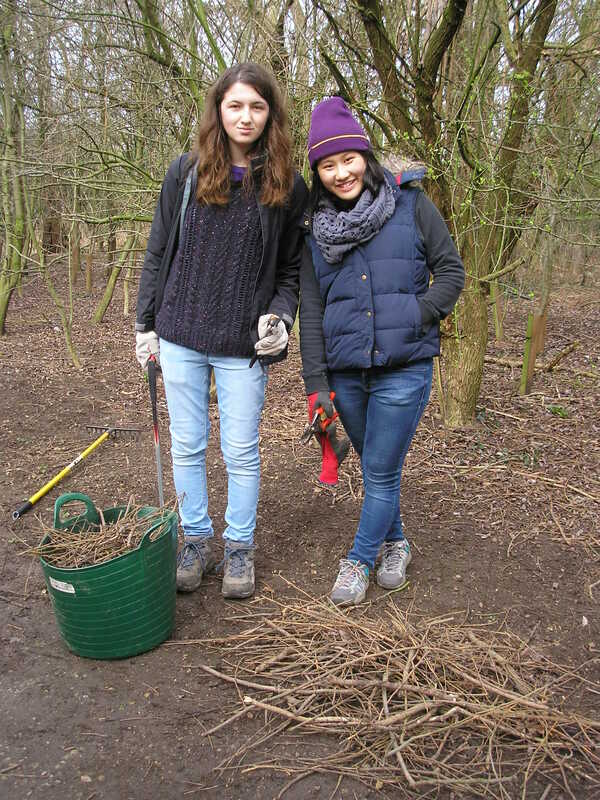 Our Sunday Morning Volunteer session on March 1st got off to a good start, with 8 willing helpers enjoying a sunny break between showers, so we all stayed dry (even if a little wind-swept!). 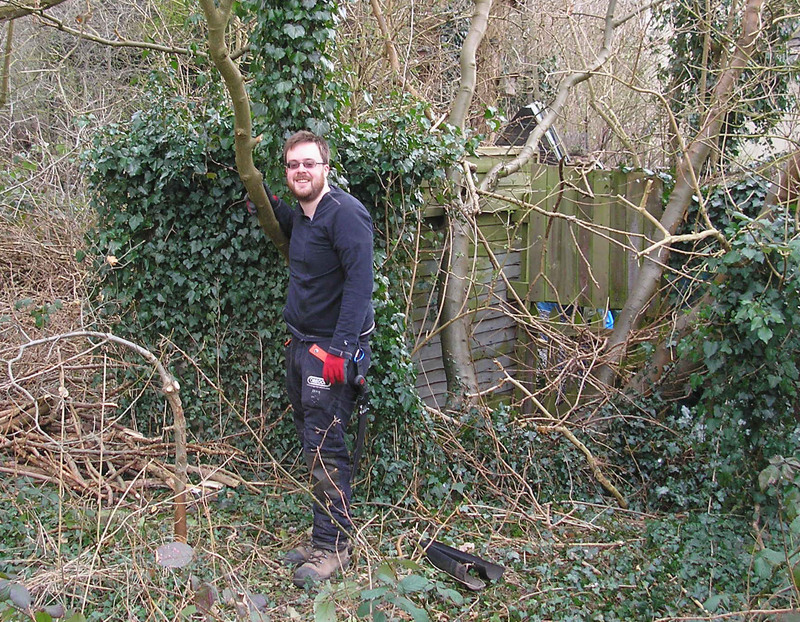 It allowed us to almost finish turning the overgrown area west of the playground into a more appropriate and attractive woodland area. It should now have sufficient spacing to maintain the remaining trees in a healthier condition and develop an attractive ground flora. MCT presented a display about its work at the Dringhouses and Woodthorpe Residents’ Forum Meeting at St Edward the Confessor’s Church, Tadcaster Road, York, on Thursday 5th March 2015. The exhibit included a video about the progress MCT has made since it took over managing the site.